I don’t have much experience writing with brush pens like the Kuretake Bimoji, but I was quick to learn that they take a bit of skill to use. Writing with the Bimoji is a lot like writing with a fine-point permanent marker; its porous tip narrows to a point, creating a line width that varies depending on how you angle the pen in your hand. Consequently, the handwriting of an inexperienced brush pen user can look very sloppy, but once you got the hang of it, the Bimoji is a really fun pen to use. The Bimoji stands out among all my other pens both for how it looks and how it writes. 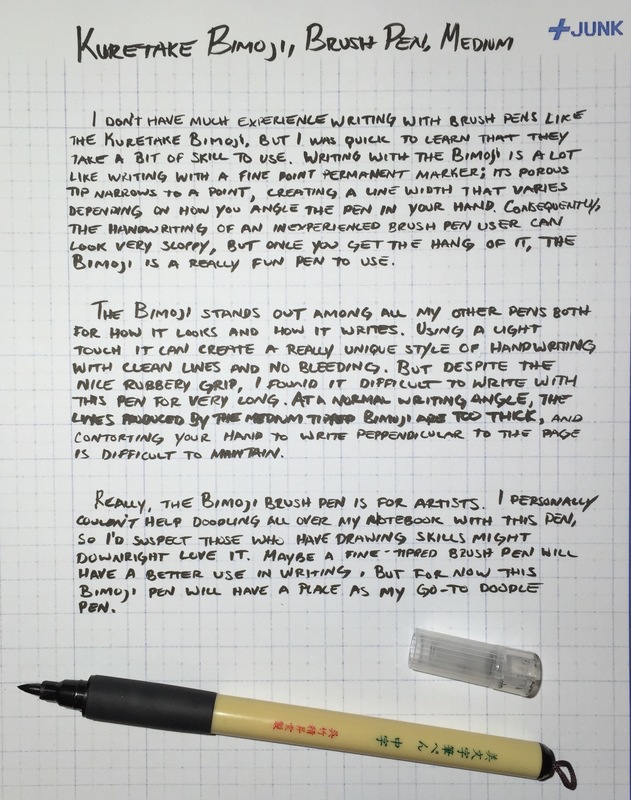 Using a light touch, it can create a really unique style of handwriting with clean lines and no bleeding. But despite the nice rubbery grip, I found it difficult to write with this pen for very long. At a normal writing angle, the lines produced by this medium tipped Bimoji are too thick, and contorting your hand to write perpendicular to the page is a difficult position to maintain. 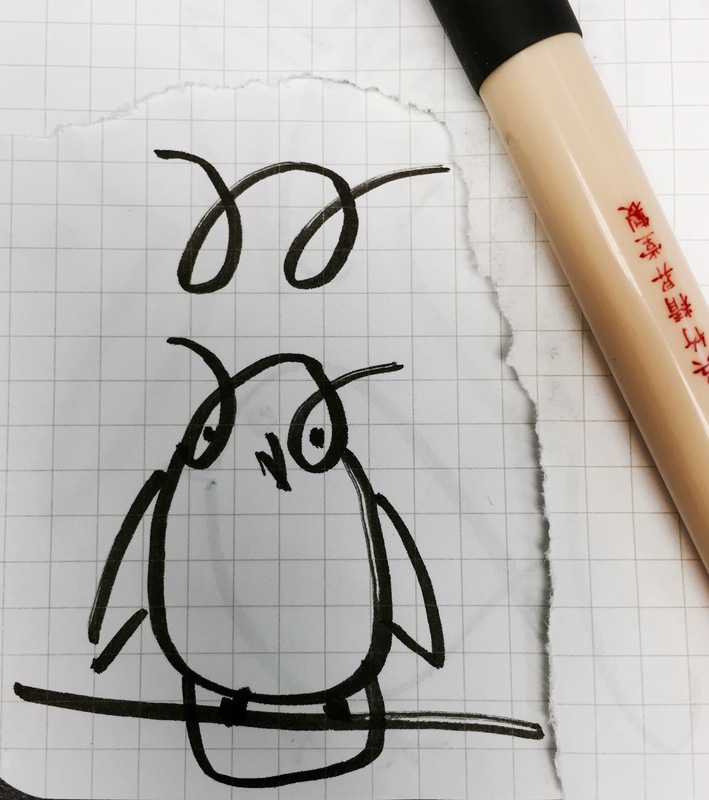 Really, the Bimoji brush pen is for artists (and for writing in Japanese characters). I personally couldn’t stop doodling all over my notebook with this pen, so I’d suspect those who have drawing skills might downright love it. Maybe a fine-tipped brush pen would be more appropriate for writing, but for now this Bimoji will have a place as my go-to doodle pen. The review at Natto Soup mentions that the cap posts on the end of the barrel in a strange way. Honestly, I wasn’t even sure that the cap was intended to post, so I just kept it off to the side whenever I used it. JetPens has a short video of somebody writing Japanese characters with the Bimoji, and it’s beautiful – it looks like art. Pocket Blonde’s review mentions that the extra fine tipped Bimoji is good for writing.